Its late evening in most of Asia and midnight in some parts. But, one country is already witnessing the breaking of a unique dawn, one that is going to stay on for days to come. Its Myanmar (Burma). What is unique of this dawn? First, its the dawn of democracy that has come after a long, dark night of armed rule. Secondly, this dawn has been made possible by a woman. The name's Aung San Suu Kyi. She, of a frail frame but of iron will. She, who is the voice of dissidence. She, who is persistence, resistance and inspiration reincarnated. We all know of her story: born in Burma, married and settled in the UK, she returned to Burma to lead the country and, in the 1990 general election, steered her party to a landslide victory. But the anti-democracy Junta government put her under house arrest where she would stay for almost 15 years. She didn't meet her family for over a decade and when in 1999 her husband died, she couldn't be there even to pay a final visit. Awards after awards flowed in, including the Nobel peace prize, but Suu Kyi couldn't step out of her home to receive them. No other leader I know, except Nelson Mandela of course, has undergone such tragedies and difficulties, just for the sake of democracy and love for the country. However, no amount of evil, suppression and isolation could take away her will or her ability to lead Burma towards democracy. And this Sunday(1st April) , when Burma had its general election again, Suu Kyi, freed by the Junta government earlier, was there, as its emerging, beloved leader again. 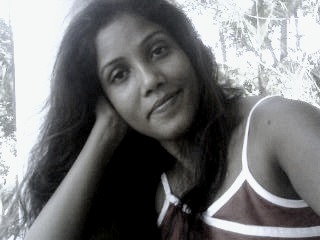 I visited Burma in 2008, just when the country was hit by its worst natural disaster till date: a cyclone. It paralyzed the country's communication system, the transport and worst of all, its food supply system. Thousands were rendered homeless and starving. The international community sent food and medical aid, but the ruling army-run government refused and instead, shut the border. I was right there, inside the country then, though I had to turn back as traveling became impossible at that point. During my week-long stay, all I could see and feel was fear. They were afraid to talk and say - of course unknowingly - something against the government and, afraid of being detained or jailed as a dissident. So, a huge disaster had happened, people's lives were disturbed beyond imagination and yet nobody was even ready to talk about it! I blogged about it later and titled it "Gag - the order of the day, "
Coming from India, where we widely enjoy freedom of expression and speech and where criticizing and joking of the politicians is almost a national hobby., it was a rude shock to see nobody willing to talk to strangers, especially on issues like politics and government in a country right in my neighborhood. Many a times I was hinted at having 'observers'(in other words, spies) in my audience. 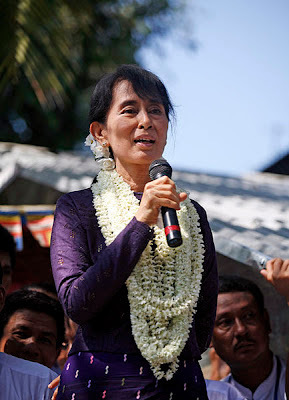 At that time one sentence that I heard again and again was: "when Suu Kyi comes, things will change. You do come back then"
Today, as I write this, Suu Kyi's National League for Democracy has just been declared victorious in the election and is all set to form the government in the country. With this, democracy is here. And now, I can think of going back to Myanmar for another visit. When I do that, I know I can talk to people on the street and they don't have to be afraid of being detained for discussing the Junta regime or saying a thing or two against the government. Because, they will now have people's power. And this - nobody would deny admitting it - has been possible because of Suu Kyi who never called it quits. That's what makes her a true fighter. A true leader. And above all, a real woman.